China Marks creates beautifully chaotic works that are inspiring, new hybrids of embroidery, drawing, and collage. Her dense process-driven creations can initially be described as drawing with thread into fabric fragments, with which she constructs twisted tales. Over time she builds up her creations by working and re-working thread upon thread, with fabric collage that is applied, removed, and reshaped. Combined with addition of digitally embroidered sketches and text, the end result is a wonderous landscape filled with warped characters, dark humor and dense narratives. The artist’s prolific output can be broken down into four main component series, and the level of complexity builds from one to the next. The simplest are the Broadsides Series. These are almost exclusively dedicated to witty digitally embroidered texts- the thoughts and declarations that fill her mind as she works. They often pack a political, or melancholy, punch, and are usually accented by a singular, minimal illustration or collaged fabric image. China Marks introduces slightly more elaborate scenarios with her Short Subject Series. These tend to be composed on white backgrounds. She starts with a hand-drawn sketch that is scanned, run through CAD software, and then plotted out with a digital embroidery machine. Over this initial layer she will constantly rework the forms and collage elements to reveal characters as well as digitally embroidered dialogue. In these comical mini-worlds, the figures question their own motives, stand up for their principles and defy convention. 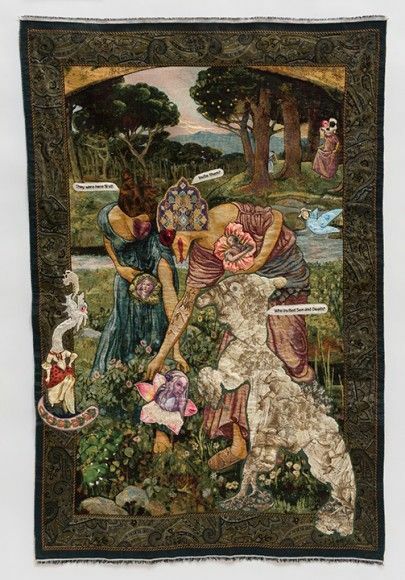 In the Altered Paintings Series, Marks starts with a commercial tapestry reproduction of famous, and some not-so-famous, 14th-20th Century paintings. These can range from kitschy, lesser-Baroque landscapes to more recognizable works by da Vinci, Vermeer or Cezanne. The scenes in the tapestries have already been diluted and translated through a number of processes before they roll off the factory’s digital loom. However, their pixelated interpretations are fertile ground for the artist to work, as she transforms them into totally new, densely active dramatic stories that almost completely obliterate the original image. China Marks is not so much addressing Art History as using it as a material with which to build, much the same way a sculptor might look at clay. These are the largest scale of the wall-mounted series she produces. In them, old gods learn new tricks, creatures abandon the higher realms, and wild children take flight in search of their enemies. To paraphrase one of the artwork titles: Hell does indeed have its charms. This process of transformation is taken to its logical conclusion in China Mark’s series of artist books. These soft-form books are large, heavily worked stages where she has room to relate longer adventures through time. On view here is her newest tome: The Stolen Child. This is a story of fairies, kidnapping, political intrigue and unbreakable family bonds. It has the physical presence of a rare, old manuscript, but also the colorful vibrancy of an animated film. As always, much is hidden in the patterns and stitches and contorted designs. The worlds that China Marks creates are fascinating and expansive. They are an impressive amalgam of imagination, technology, innovation, history, politics, identity and boundless energy. Their complexity and attention to detail draw us in and command us to dedicate the time to fully grasp and enjoy them.